Winterfield is a little gem of a course located in the popular seaside town of Dunbar, East Lothian, just 45minutes from Edinburgh along the A1. Idyllically situated right on the coast, you are welcomed to the stunning sea views of the Firth of Forth, the Bass Rock and the Isle of May with the Lammermuir Hills as a backdrop. Winterfield is a relatively short course in terms of distance, but don’t let this fool you! There are 8 par 3’s, but only one is less than 170 yards, making it a challenging game for even the very best. The first is an absolute cracker. From the tee, it’s a 220 yard carry over a ravine to reach the pin. Let’s just say it’s not the easiest of opening tee shots. While you’ll be put to the test on the opening 9, the rewards are plentiful on the back. 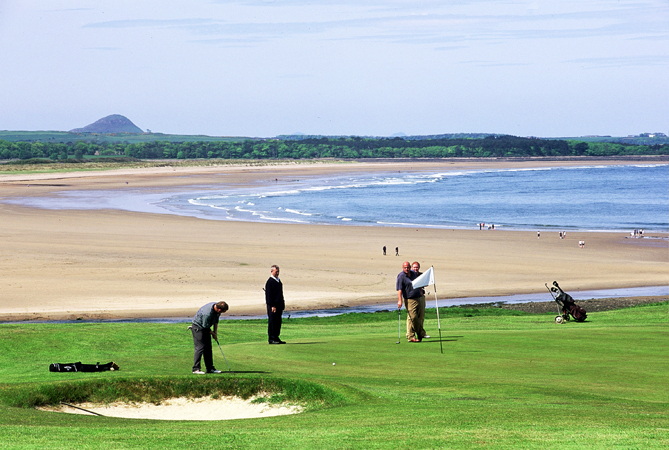 With a stretch of holes looking out to the Bass Rock and neighbouring Belhaven Beach, Winterfield is quite simply stunning. Our friendly golf professionals are on hand to provide you with some tips for the course, and stock a wide selection of golfing merchandise, as well as all the essentials. After your round, you’ll receive a hearty welcome in the recently refurbished clubhouse to enjoy a refreshment or delightful meal. Group bookings, society and corporate events welcome. Once played, this course is never forgotten.